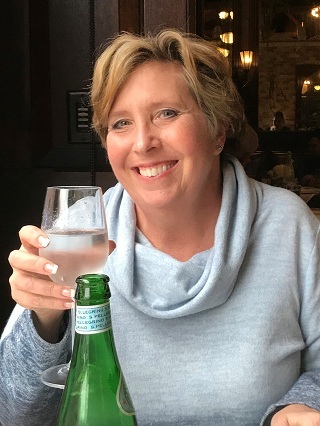 Anna Margaret (Meg) Smith, age 52, of Prairie Village, KS, passed away in her home May 17, 2018. Meg was born March 17, 1966, in Denver, Colorado. She was a graduate from St. Mary’s Academy in Denver, received a B.A. in Psychology from the University of Missouri—Kansas City, and later earned her certificate in addiction counseling. She worked in the fields of social work and counseling, working at various times as an occupational resource counselor for blind and low vision persons, a caseworker for child and family services, and an addictions counselor. Meg moved to Kansas City in 1988 and married Andrew Derek Smith on October 1st of that year. Their daughter Catherine Paige was born in 1990. Meg was a loving mother and wife. She was devoted to her family, supporting Andy’s work and hobbies and relishing Paige’s many accomplishments. She also loved her family of origin and her in-laws. Family was always important to Meg. Meg was a free spirit and highly artistic. Through her creativity, her endearing silliness, and her knack for elegance, she had an unequivocal way to make your day with the smallest gesture. Meg was always engaged in a project. Whether quilting, soap making, gardening, or flower arranging, she was continually feeding her creative soul. Her many friends and family were the lucky recipients of her cooking and candy making. Meg loved her Colorado roots. Some of her happiest times were spent fishing a trout stream, strolling through an aspen glade, or picking wildflowers in a mountain meadow. Throughout her home she surrounded herself with mementos of her beloved Colorado. Recovery from addiction and depression was an important part of Meg’s later life. She found healing in helping and working with others. The recovery community was a source of strength and support to her. She volunteered at Pet’s for Life, where she took her beloved sheltie to nursing homes to provide companionship to residents. At Unexpected Blooms she volunteered her time by preparing flower arrangements for hospice and nursing home residents. Meg will be remembered for her wonderful sense of humor, her generosity, her deep sense of caring, and her enormous heart. Her life touched countless people. The world was a better place with her in it. She will be greatly missed. Meg is preceded in death by her father and mother Gerald Paul and Mary Elizabeth (Kimmel) Ivancie, brother John Kimmel Ivancie, and nephew Sean Ivan Nolimal. She is survived by her husband Andrew Derek Smith; daughter Catherine Paige Smith of Denver; and siblings Mayerle Ann Neher (Graydon) of Castle Pines, Colorado; Elizabeth Ann Kennedy (James) of Grand Junction, Colorado; Stephen Kolar Ivancie (Diana) of Steamboat Springs, Colorado; Molly Ursula Ivancie of Littleton, Colorado; Paul Gill Ivancie (Ann) of Denver; Monica Ann Ruiz (Louis) of Denver; Mary Katherine Ivancie of Denver; her mother and father-in-law Ruth Ann and Hubert Duane Smith of Platte City, Missouri; six nieces and nephews; and two grand-nieces. In Meg’s memory, donations are encouraged for Unexpected Blooms (unexpectedblooms.org). Flowers will be received at the Queen of the Holy Rosary Catholic Church, 7023 W. 71st St., Overland Park, Kansas, prior to the Visitation at 9:30 a.m. Wednesday, May 30, 2018. Funeral mass will be conducted at 11:00 a.m. with reception (at the church) to follow..
What a beautiful tribute to our Megs's life. May she rest in peace and be cradled in the loving arms of our Lord. You will always be in our hearts and minds especially when walking under the shade of an aspen grove searching for wildflowers. It was with great sadness I learned of Meg's passing. While only having met Meg a few times at social events with Andy, she was always fun to be around and I thoroughly enjoyed our converations, especially all things "Colorado". I am sorry for your loss. You have my deepest sympathy. There aren't words to convey the depth of what the world has lost. For many of us, you were such a guiding light and force for good. Wherever you are now, I hope you are so deeply loved and will be dearly missed forever. I am so sad to learn of Meg's passing. She was a bright light in this world and a source of joy for myself and everyone who had the privilege to be around her. I will miss her dearly. Sending love to Andrew, Paige and the family. Andy and Paige, may you find some comfort in knowing we all are sad hearing of Meg's passing. She was a dear person to me, in sharing our love of quilting and crafts and her flower arrangements were fabulous. Meg loved you both very much and feels great joy in Paige's interests and great comfort in your support and steady guidance, Andy. I will miss her and want you to know she did what she could and that is all we can ask of her. I was saddened to hear about Meg passing on, today. I really liked Meg and was grateful for the opportunity to get to know her. I admired her courage and honesty. I remind myself that spirit is eternal and that Meg's spirit will always be with her family of origin and us, her expanded family, when we choose to call on her. Sending love and light to her family(ies)! Meg was a laugh. Fun times we shared as children. Her daughter Paige is beautiful and Meg did a great job raising such a wonderful young woman. My heart goes out to Meg’s husband and daughter as well as her extended family. She is at peace and our prayers will ease her way to heaven. With love and prayers. The Faulkner family. I will always remember Meg as a dear sweet girl who loved to perform unexpected, "random" acts of kindness. For my family it was placing flowers on my sister's grave in Independence because we were not able to do so ourselves. It breaks my heart to think of her gone so soon, so young. My love and condolences to the Ivancie family and to her husband and daughter and family in Kansas. My heart is truly broken. Meg saved my life almost nine years ago. She was my best friend. I wish she could have seen herself the way I and God saw her. I will miss our lunches at Houlihan’s, our talks, her sense of humor and huge heart. Meg, you were the wind beneath my wings. My condolences go out to Andy and Paige. Love you Meg!